The logo has landed and its been well worth the wait. 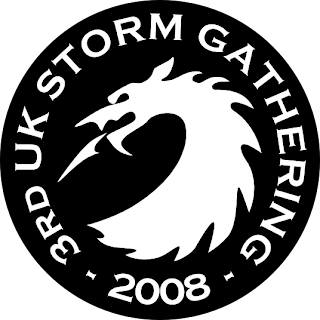 The 3rd UK Storm Gathering has now got a unique and identifiable emblem which I think reflects well both the nature of the event and the heritage of Wales where the symposium is being held. A tremendous thanks goes to Aled Williams of Tiderace Kayaks who has once again applied his superb design skills to the task. As instigator of the 1st UK Storm Gathering I hope these events will continue over time, roving from one paddle destination to another, each with its own special theme (and logo). There is a wish also that such gatherings will encourage others to bring about their own paddling festivals, whatever the time of year, as its great fun being around like minded people sharing in the wealth of experience that comes together on such occasions. For now though, 2008 will be on Anglesey, 2009 will be in Cornwall.........so that just begs the question, where to go in 2010?